And how could anyone not love Hoi An? Lit up with hundreds of lanterns by night, it is one of the most beautiful towns in the country. During the day, you get a chance to explore all those historic houses, walking through courtyards and enjoying the view from balconies. And to make things even better, the ruins of a jungle temple are within reach and make up for an easy day trip. Hoi An is how I always imagined Vietnam to be. Ancient, yellow houses decorated with wooden elements, lit up with a hundred lanterns at night. Locals with coned hats cycling the streets, boats going up and down the river to release floating lanterns for good luck. Streetfood at the night market and along the river, restaurants, bars and cafes inviting me to sit down and take it all in. 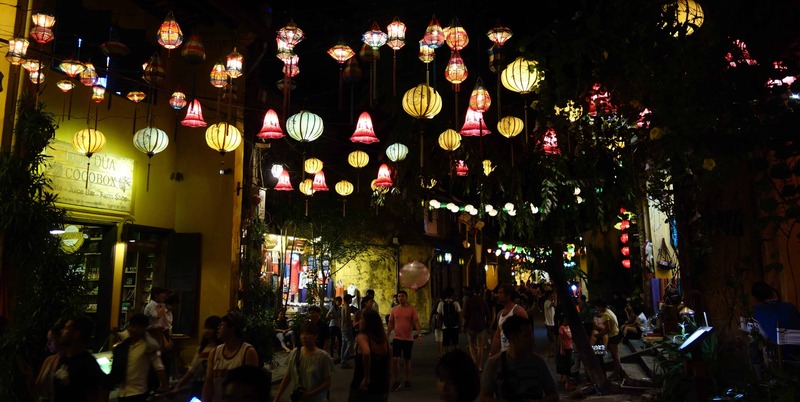 Hoi An is beautiful during the day, but it truly comes alive at night. Search out the alleys of the Old Town and you can easily spend hours walking through them and getting lost in the crowds. While Hoi An is at its most beautiful during the night, the Old Town houses are most interesting during the day. Buy an Old Town ticket and it will grant you access to five touristic sights of your choice. We asked at the tourist information for recommendations, but I think that no matter what you choose, you are not going to regret it. One of my favourites was the Old House of Tan Ky. This family residence features many details typical to Hoi An houses and a short guided tour informed us about what it must once have been like to live in one of those houses. The assembly halls are a great stop on your way through the Old Town, too. This is where merchants once met to pray and discuss trade. 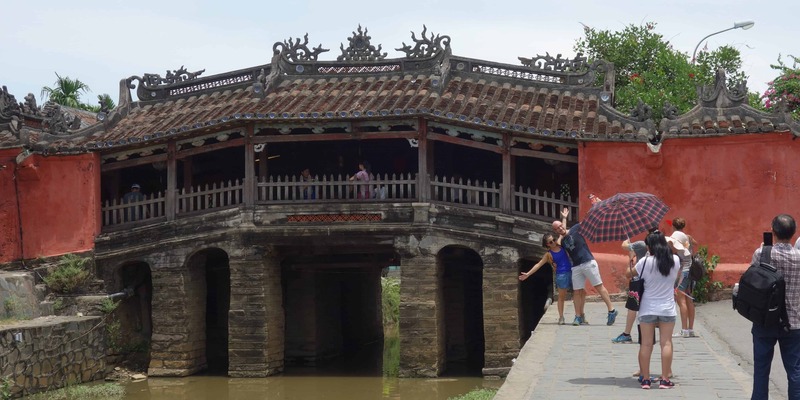 Also, make sure to stop at the Japanese Covered Bridge, a symbol of Hoi An. The entrance ticket to the Old Town allows visitors to see a cultural song and dance performance. Inquire about the schedule when you buy the ticket (if you miss it, a couple of places around the Old Town offer cultural performances, too). 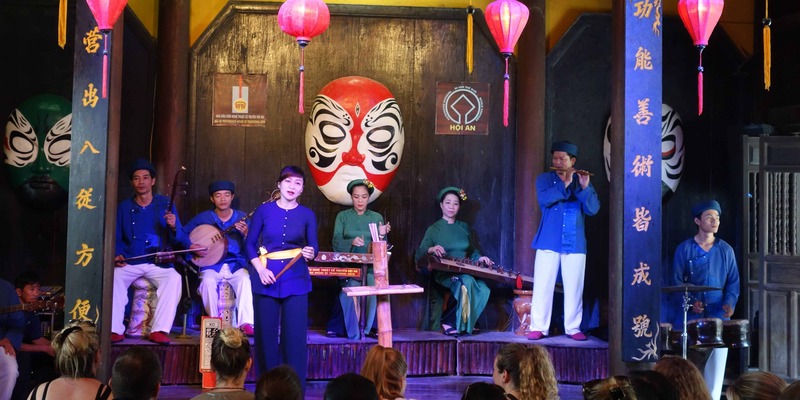 The show consisted of traditional Vietnamnese music and dance. They started by playing intruments, then a singer and dancers were introduced. While it was obviously made for tourists, it was a great way to get an insight into culture and traditions that we never would have encountered otherwise. The ruins of My Son, located close to Hoi An, are one of my favourite places in Vietnam. These Hindu temples were constructed between the fourth and the fourteenth century by the kings of Champa. Unfortunately, they were heavily bombed during the Vietnam war, when the Vietkong used to hide in them, but many are still standing and others have been restored. Up until today, it is a mystery which material was used as mortar to hold the bricks together. No moss or plants grow on it. The most likely theory is that it was some kind of tree resin, but scientists are still not sure. You can visit My Son as a day trip from Hoi An. Any travel agency around the city can help you arrange transport (some include a guide as well), or you can rent your own scooter to come here. Sometimes, when I feel like cooking an Asian dish, I will browse through my recipes from Hoi An. I took a cooking class with Morning Glory here in 2011 and loved it. 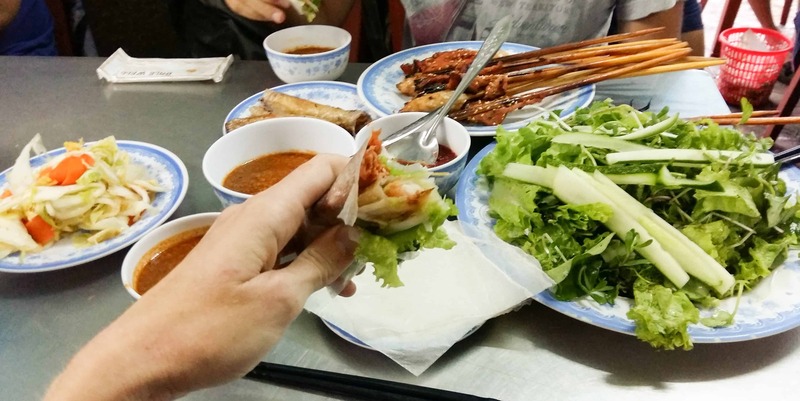 We started with a market tour, then learned to cook several Vietnamnese dishes. The instructions were simple enough to follow (I still don’t know how my friend managed to set her pan on fire), the food was delicious and I learned a lot about Vietnamnese and Asian cuisine in general. Cooking classes are always a great way to get to know a country. Hoi An has a great choice of restaurants offering courses, so if you have a spare day, I highly recommend you take one.